Ethiopia boasts a wide range of tourists attractions and activities range visiting its historical cities, observing its cultural diversity and experiencing its national parks. The Danakil Depression is located in the northeast of Ethiopia in the Tigrain Highlands. It has been formally noted as one of the driest and hottest places on earth having an average temperature of thirty-five degrees centigrade. It is an astonishing area of geographical elegance, a place occupied by active volcanoes, a lava lake, salted basins, lunar landscapes and hot springs. It is the second lowest place in the world and the lowest place in Africa. Another invigorating place to visit is the Blue Nile, the longest river in Africa. Locally referred to as Tis Isat its a 45 meter deep and 400-metre wide waterfall is spectacular. The epithet of ‘best-kept secret’ has been applied to so many modern mediocrities that it seems ludicrously inadequate when confronted by religious sanctuaries as magnificently obscure as the churches carved into the sandstone cliffs of Tigrai. Practically unknown to other Ethiopians – let alone the outside world – before 1966, the rock-hewn churches of Tigrai have been described by the British academic Ivy Pearce as ‘the greatest of the historical-cultural heritages of the Ethiopian people’. Most of these architectural gems remain in active use today, several house paintings and other sacred medieval artefacts, and every one of them is imbued with an aura of spirituality that seeps from the very rock into which they are carved. The rock-hewn churches of Tigrai do not function primarily as tourist attractions. The most popular and accessible of these churches might be visited by outsiders once or twice a week, the rest perhaps every two or three months. As for the rest – well, it would not surprise me to learn that half of the rock-hewn churches in Tigrai have gone unseen by foreigners since the 1974 revolution. Visits by foreigners are generally tolerated, sometimes welcomed, and occasionally met with visible distrust. With sufficient time, and a philosophical frame of mind, exploring these churches is likely to be a highlight of any trip through Ethiopia. Many of the Tigraian rock churches lie along the main road between Adigrat and Mekele, or can be visited from it. Four main clusters are covered here, of which the churches that lie along the main road between Freweyni (formerly called Sinkata) and Wukro are the most accessible to those without private transport or with limited time. The pick of these churches is undoubtedly Adi Kasho Medhane Alem, part of the highly accessible Teka Tesfai cluster 10km south of Freweyni/Sinkata. A second rather loose cluster consists of Wukro Chirkos – the most accessible of all the Tigraian churches, as it lies 500m from the main road in the town of Wukro – and the magnificent Abreha we Atsbeha Church along the Hawzien road. The most extensive cluster is found in the Gheralta region, which lies to the south of Hawzien and includes some of the most stunningly situated churches anywhere in Ethiopia. Gheralta can easily be explored out of Hawzien with a vehicle or from Gheralta Lodge, arguably one of the finest boutique resorts in the country. It could also be explored over a few days of hiking, bearing in mind that the region’s finest churches are reached by long, steep walks that require a fair level of fitness. A fourth and more dispersed cluster lies in the Atsbi area, to the east of Wukro. With one exception, the Atsbi churches can be explored only with a vehicle. The well-defined ‘historical circuit’ through northern Ethiopia forms the core of the country’s tourist industry. It is probably no exaggeration to say that 90% of travellers to Ethiopia base the bulk of their itinerary around this circuit, and rightly so. There is nothing in sub-Saharan Africa – in a sense, nothing else in the world – that prepares the visitor for the wealth of historical and cultural treasures, both ancient and living, contained in northern Ethiopia. The circuit pivots around four cities, all very different from the others, and followed in this section in the clockwise direction favoured by most tour operators and independent travellers. 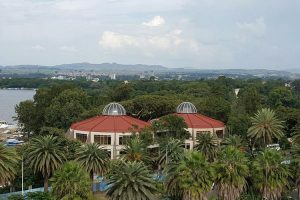 The standard first stop in northern Ethiopia is the modern city of Bahir Dar, a bustling commercial centre set on the southern shore of Lake Tana, the largest body of water in Ethiopia and official source of the Blue Nile. In addition to hosting a fascinating traditional daily market and rich birdlife, Bahir Dar forms the obvious base for several day trips: to the multitude of atmospheric medieval monasteries dotted around the forested islands and peninsulas of Lake Tana, as well as to the sensational Blue Nile Falls (sensational, that is, on the increasingly rare occasions when the Nile’s water hasn’t been diverted to fuel a neighbouring hydro-electric generator). To the north of Lake Tana, a popular second stop on the northern circuit is Gondar, which served as Ethiopia’s capital for almost 300 years from 1635 onwards, and is today noted for its impressive 16th-century castles as well as the beautifully decorated Church of Debre Birhan Selassie. 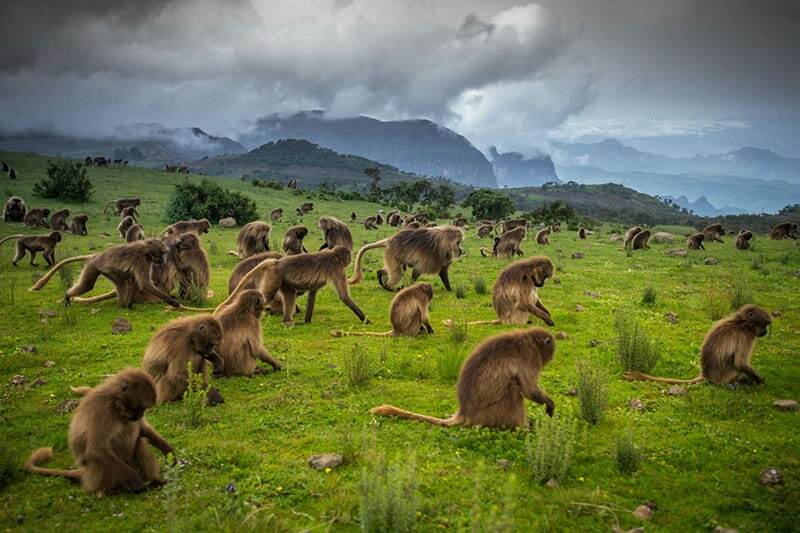 To the north of Gondar, lies the staggeringly scenic Simien Mountains National Park, home to the country’s main concentrations of the endemic gelada baboon and Walia ibex. Following the recent construction of a rough road into the Simien Mountains, this lovely range – traditionally the preserve of hardened trekkers and hikers – also forms a feasible goal for a day or overnight 4×4 trip out of Gondar. A common third stop on the historical circuit is the ancient capital of Axum, which lies close to the Eritrean border at the heart of the former Axumite Empire, the dominant economic and political force in the region for about a millennium prior to its collapse circa AD700. 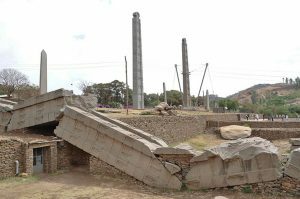 Axum is best known today for the giant engraved obelisks (stelae) that tower over the northeast of the town. But the entire city stands above a fascinating miscellany of ancient relics – dingy catacombs, ruined palaces, rock engravings and inscribed tablets – that pay collective testament to the enterprise and complexity of what is perhaps the most enigmatic of all the ancient civilisations of the Old World. This enigma is amplified when one visits the nearby Yeha Temple, estimated to have been constructed 2,500 years ago. Axum’s Church of Tsion Maryam – claimed by Ethiopians to house the Ark of the Covenant – has for more than 1,600 years lain at the spiritual heart of the Ethiopian Orthodox Church; the Axumite architectural legacy lives on in several ancient churches, notably the male-only clifftop gem that is the Monastery of Debre Damo. For most visitors to Ethiopia, the highlight of the northern circuit is the medieval capital of Lalibela, where high in the chilly mountains of Wolo stands a complex of a dozen rock-hewn churches often and justifiably ranked as the eighth wonder of the ancient world. Reachable only on foot or by mule until a couple of decades back, but now serviced by daily buses and flights, these churches stand as an inspirational active shrine to a Christian civilisation that pre-dates its northern European equivalent by centuries. And around Lalibela lie several more ecclesiastic gems: the beautiful Axumite cave church of Yemrehanna Kristos, the isolated monasteries and churches around Bilbilla, the remote montane retreat of Asheton Maryam … all set amid some of the most fantastic mountain scenery on the African continent. The majority of travellers take one of three approaches to exploring the ‘big four’ cities of the northern circuit. The first, and less strenuous, approach is to fly between the aforementioned stops, exploring the towns, and sometimes arranging day excursions to nearby places of interest. One could, in theory, see the best of the northern circuit over five days, since flights generally take only an hour or so, leaving one with plenty of time to explore in between. In practice, however, the combination of sudden schedule changes, occasional delays and the need to reconfirm all domestic flights at the point of departure, makes it advisable to dedicate about eight days to a flying excursion around the northern circuit. This will allow for a full day between flights to explore each of the major towns at leisure. A more demanding option is to drive around the historical circuit in a rented 4×4 with a driver and/or guide, or – tougher still – to do the whole circuit using buses and other public transport. The disadvantage of road travel is that it is time-consuming and sometimes exhausting – recent improvements notwithstanding, a realistic minimum of 12–14 days is required to cover this circuit by road, and three weeks or longer would be better, especially if you are using public transport. The main advantages of driving over flying are firstly that you get to see far more of the beautiful mountain scenery, and secondly that you have the opportunity of escaping the relatively well-trodden tourist trail to visit areas where tourists remain an infrequent sight. As a thorough read through this section will make abundantly clear, there is infinitely more to northern Ethiopia than its four established historical cities. The list of off-the-beaten-track possibilities is practically endless; to name one example, the vastly underrated rock-hewn churches of Tigrai alone could keep an interested traveller busy for weeks. A medieval city boasting a vast rock church complex. 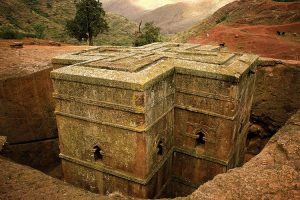 It consists of eleven magnificent rock-hewn monolithic churches that were built by King Lalibela around the late twelfth or early thirteenth century. These churches are known for their artistic grandeur and unique architectural design. The churches have been dug into the ground and the St. George’s cross has become the most famous of all the sites. Situated about 100km north of Gondar to the east side of the Axum road, the Simien Mountains are one of Africa’s largest ranges, studded with at least a dozen peaks topping the 4,000m mark. These include Ras Dejen (also spelt Ras Dashen), the highest point in Ethiopia and possibly the fourth-highest peak in Africa. The western side of the range, excluding Ras Dejen, was designated as the Simien Mountains National Park in 1969, and the entire range was listed as a UNESCO World Heritage Site in 1979. A single dirt road runs through the park, branching eastward from Debark, and then passing through Sankaber and Chennek camps en route to the Bwahit Pass, where it branches southward to terminate some 10km outside of the park boundary at the small town of Mekane Birhan. This road is open to tourist vehicles, and it provides the opportunity to see most of the park’s key habitats in a short space of time (even as a day trip from Gondar), as well as offering almost certain sightings of gelada. At the time of writing a new road was being planned running from Sawre (the park gate) to Janamora, which will bypass the main escarpment and ease traffic on the escarpment road. A less efficient but more satisfactory way to explore the Simiens is on foot or by mule, following an extensive network of tracks used by local people to travel between the villages on the lower slopes or to reach the high pastures for grazing animals. These tracks are ideal walking routes and, combined with the range’s impressive scenery, make the Simiens an excellent area for trekking. Most trekking routes take you through small villages and terraced fields in the lower valleys, before reaching a series of dramatic cliffs and escarpments. Beyond the escarpments you reach the beautiful alpine meadows and the rugged wilderness of the high peak areas. The Fasil Ghebbi (Royal Enclosure) lies at the heart of modern Gondar and gives the city much of its character. Surrounded by high stone walls, the enclosure covers an area of 70,000m² and contains six castles, a complex of connecting tunnels and raised walkways, and several smaller buildings. It’s a fascinating place to explore, and one could easily spend several hours here. At the gate an entrance fee of US$6 is levied. Tickets are only valid for the day of purchase and include still photography. A video camera attracts an additional fee of US$5. For a first-time visitor, hiring an official guide is recommended. They are generally quite knowledgeable and will point out features that might otherwise be missed. Guide fees start at around US$9 for a group of one to five persons; it is best that you first walk around under their tuition, then return on your own later to soak up some of the atmosphere. The most impressive castle within the enclosure is the original built by Fasilidas, c1640, partially restored in the mid 20th century, and more fully restored, using the original construction methods, with UNESCO funding between 1999 and 2002. Fasilidas’s Castle is made of stone and shows a unique combination of Portuguese, Axumite and even Indian influences. The ground floor consists of reception and dining areas. 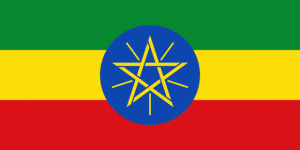 The walls are decorated with a symbol similar to the Star of David, which became the emblem of the Ethiopian royal family after the Solomonic dynasty reclaimed the throne in the 13th century. The first-floor roof of the castle was used for prayer and religious ceremonies, and it is also where Fasilidas addressed the townsfolk. Fasilidas’s prayer room, also on the first floor, has four windows, every one of which faces a church. Stairs lead from the roof to the small second-floor room that Fasilidas used as his sleeping quarters. Above this is an open balcony, which was probably the watchtower. This third-floor platform, 32m above the ground, offers views in all directions; on a clear day, you can even see Lake Tana on the horizon, emphasising the strategic advantage of choosing Gondar as a capital. The rift valley is well known for its beautiful lakes, hot springs, and a profusion of untamed African wildlife. The Rift Valley passage has a string of seven lakes and each of them have their own uniqueness. For animal lovers, this is the are to visit as it is teaming with wildlife. There are many hot springs, all visited for their curative attributes and people from far and wide in the country come to bathe in them. 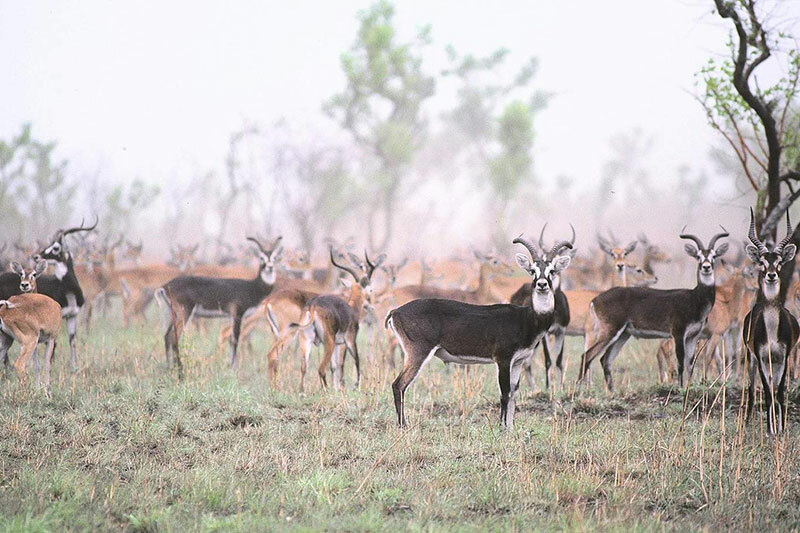 White-eared Kobs inhabit the Gambella Boma ecosystem, which is one of the most ecologically diverse in the African continent, encompassing moist forests and the floodplains of the rivers Baro, Alwero, Gilo, Pibor and Akobo. This landscape represents a transition from the East African ecological zone to the Central African ecological zone, harbouring wildlife species that are classified on the IUCN Red List as Endangered including Nile Lechwe, Lelwel Hartebeest and many species classified as Vulnerable like the African elephant and lion. The area also supports Vulnerable avian species like the shoebill stork and the Bllack crowned crane. White-eared Kobs (Kobus kob leucotis) in the Gambella landscape are a keystone species migrating between South Sudan and Ethiopia. The largest part of the White-eared Kob population shared between Ethiopia and South Sudan leave Ethiopia around June at the start of the wet season, when food and water is abundant, possibly to avoid surface flooding that occurs during the rains from June to November. Most Kobs migrate to South Sudan, which has less rainfall. The animals return to Ethiopia during the dry season lasting from December to May, when the surface flooding has dried up. This covers parts of Ethiopia lying to the east of the capital. You can amble along the surfaced road between Addis Ababa and the large but rather bland town of Adama (Nazret). This 100km stretch of asphalt can be covered in a couple of hours or over several days, with obvious highlights including the wetlands around the Akaki River, the air-force town of Bishoftu (Debre Zeyit) and its attendant crater lakes and the atmospheric mountaintop monastery at Zikwala. All these places can easily form the goal of a self-standing day or overnight trip out of the capital. They can also be visited en route to southern Ethiopia – the junction for the main road south lies at Mojo, 75km from Addis Ababa, while Adama itself is the starting point for an important route south to the highlands of Arsi and Bale zones. Moving on, Awash National Park is the closest thing Ethiopia has to the savanna reserves of East Africa, and an excellent overnight trip from Addis Ababa. It also covers the arid section of the Rift Valley that follows the course of the Awash River north of Awash National Park to its delta in a series of desert lakes near the Djibouti border. Although little visited by travellers, this is a fascinating and very different part of Ethiopia, home to the pastoralist Afar people, and – somewhat unexpectedly – bisected by what is arguably the best surfaced road in the country. And finally, further east find the alluring walled city of Harar, the spiritual home of Ethiopia’s large Muslim community, as well as its altogether less inspiring modern twin city of Dire Dawa. Lying more than 500km east of Addis Ababa, Dire Dawa and Harar are accessible from the capital not only by road, but also by daily Ethiopian Airlines flights – not to mention the country’s only passenger train service! The base from which Ahmed Gragn waged his 16th-century jihad against the Christian highlands, Harar formed the most important trade centre in Ethiopia for much of the 19th century – when it was visited by the explorer Richard Burton and home to the French poet Arthur Rimbaud – and it is also the birthplace of the late Emperor Haile Selassie. Today, the old town is one of the most popular tourist sites in Ethiopia. Not only does its labyrinth of alleys and Muslim shrines provide a striking contrast to the Christian pre-eminence in northern Ethiopia, but it is also home to the renowned hyena men of Harar. An ancient holy city dating to about 1520, and the oldest Islamic city in Africa. This city is renowned for its ancient structures and its city walls. There are about 99 mosques and a school of Islamic culture. The real highlight are the hyena residing there. These hyenas are known to scavenge for food at night inside the city. They have been befriended by some local men who feed them and allow you to feed them. Ethiopia is not one of the world’s more crowded travel destinations, and while I have no idea what proportion of travellers to the country head south of Addis Ababa, about 20%. Given the singularity of northern Ethiopia’s cultural sites, the relatively scant attention paid to the south is understandable enough. And yet, were north and south to split into separate countries tomorrow, southern Ethiopia could more than stand on its feet as a tourist destination in its own right. Although most African countries pale by comparison with southern Ethiopia when it comes to historical sightseeing – rock-hewn churches, mysterious medieval stelae and remote monasteries being among its underrated attractions – the region is of primary interest for its natural and cultural attractions. Bale National Park is the best part of Ethiopia for viewing endemic wildlife, home to the country’s largest (though still scarce) populations of Ethiopian wolf and mountain nyala, as well as half the birds whose range is restricted to Ethiopia and Eritrea. In addition, there is the lovely string of lakes along the Rift Valley floor, the lush forests of Wondo Genet and southern Bale, the vast arid plains south of Dilla, the majestic setting of Nechisar National Park. This, in short, is a region of exceptional natural beauty and variety. 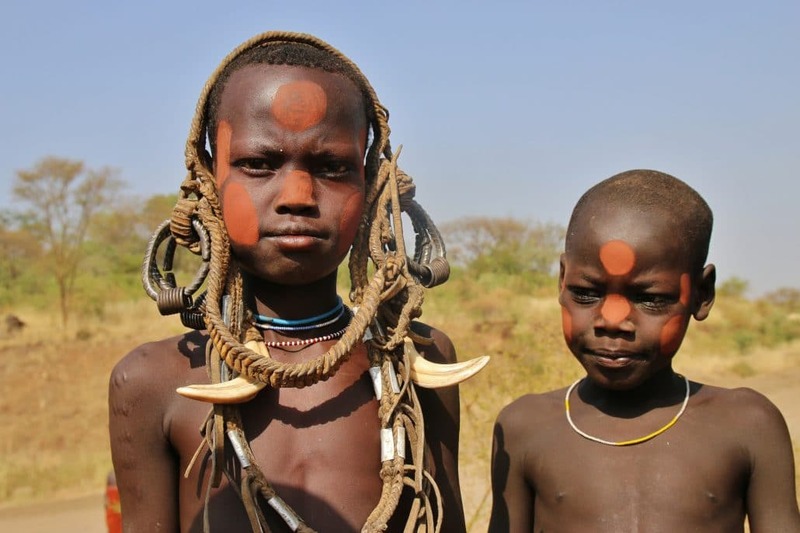 Culturally, the highlight of southern Ethiopia is South Omo, a remote zone tucked against the Kenyan border where a dozen or more different ethnic groups live – and decorate themselves – in a manner that scarcely acknowledges the 20th century ever happened, let alone the 21st. No less interesting are the Konso people and their walled stone villages, the Dorze with their tall conical huts, and the semi-nomadic Borena with their precious cattle herds and singing wells. Tangled into this rich cultural mosaic are the Oromo, Ethiopia’s largest ethnolinguistic group, with one foot in the modern world, and the other hoisting them up onto the saddle to ride blanketed through the frosty Bale Highlands. Southern Ethiopia lacks for any clearly defined tourist circuit, and it would be limiting rather than helpful to attempt to describe it in terms of a prescribed loop. The main regional transport hub is Shashemene, which lies at the junction of the roads north to Addis Ababa, west to Arba Minch and South Omo, south to Hawassa (Awassa), Dilla and Moyale, and east to Dodola and Bale. Passing through Shashemene. There is an obscure but rewarding route running south from Addis Ababa to Butajira and Hosaina via Melka Kunture Prehistoric Site, the rock-hewn Church of Adadi Maryam, and the Tiya stelae field. Another follows the Rift Valley and its lakes from Addis Ababa south to the junction town of Shashemene and city of Hawassa (Awassa). 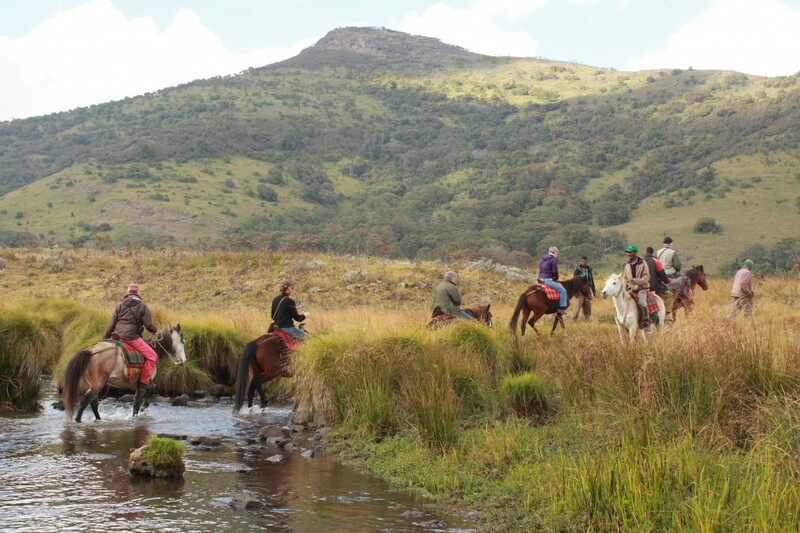 A third covers the wonderful trekking country and wildlife of Bale Mountains National Park and environs. A fourth covers the road from Hawassa south to Moyale on the Kenyan border. There’s also the option to concentrate on Arba Minch and Nechisar National Park, or on the cultural wonders of Konso and South Omo. This scenic 2,200km² national park, set aside in the 1960s but never officially gazetted, protects the higher reaches of the Bale range, including Mount Tullo Deemtu, which at 4,377m is the second-highest peak in Ethiopia. The main attractions of the park are the wild alpine scenery, particularly on the 4,000m-high Sanetti Plateau, and the relative ease with which one can see up to a dozen endemic birds as well as Ethiopian wolves and mountain nyala. Bale is very accessible on public transport, and can be explored on foot, on horseback or by vehicle. The road across the Sanetti Plateau, built by the Derg to provide an alternative emergency access route to the south, is reportedly the highest all-weather road in Africa. The Bale Mountains are of relatively ancient volcanic origin, having formed from solidified lava more than ten million years ago. The slopes above 3,500m supported glacial activity until as recently as 2,000 years ago, and still receive the occasional snowfall, most often in the dry season between November and February. More than 40 streams including the Web, Genale and Welmel rise in the Bale Watershed, most of which eventually flow into the mighty Juba or Wabe Shebelle rivers after they cross the border into Somalia. The main habitats protected by Bale are juniper and hagenia woodland, Afro-montane forest and Afro-alpine moorland. The juniper–hagenia woodland lies at elevations of between 2,500m and 3,300m, and is mostly found on the northern slopes, such as around the park headquarters at Dinsho. At similar elevations on the southern slopes, the vast and little-studied Harenna Forest is the park’s main stand of Afro-montane forest. Afro-alpine moorland is characteristic of altitudes above 3,500m, with the most extensive patches to be found on the Sanetti Plateau and in the Web river valley. The moorland, as well as the open vegetation below the forest zone, is characterised by wonderful wild-flower displays, particularly between August and November. One of the most common and distinctive plants throughout the Bale region is the red-hot poker, an aloe that grows to shrub height and can be identified by its orange spear-shaped flowers. The characteristic large mammals of Bale’s juniper woodland are the mountain nyala and Menelik’s bushbuck (both endemic to Ethiopia), as well as warthog and bohor reedbuck. Moorland is the favoured habitat of the Ethiopian wolf. Commonly seen mammals of the extensive Harenna Forest, which lies south of the Sanetti Plateau, include guereza, vervet monkey, the localised bamboo-dwelling Bale monkey, olive baboon, Menelik’s bushbuck, bushpig and the lesser known giant forest hog. Large predators such as lion, leopard and African wild dog are still resident but are seldom seen by visitors. Bale National Park region is undoubtedly the best part of Ethiopia for endemic birds. Accessible as it is today, Bale was one of the last parts of Africa to attract serious scientific exploration, and it remains sufficiently out of the way even today that very few travellers make it there by comparison with, say, the Simiens. More than any other part of the country it’s the lush western highlands, all rolling hills, neat cultivation and dense montane forest, that subvert preconceptions about Ethiopia being a land of desert and famine. Despite its natural beauty, the western highlands lacks for a well-defined sightseeing route and boasts few organised tourist attractions, meaning the region is largely ignored by travellers. This, really, is half of the charm of western Ethiopia: one of Africa’s great off-the-beaten-track loops, an area of intimate and lush green scenery broken into convenient day-sized travel bites by a series of well-equipped towns. The ultimate goal for any traveller heading west of Addis Ababa is the steamy riverport of Gambella, reached via a dramatic descent from the breezy highlands into the sweltering Sudanese border region. Set on the northern bank of the Baro River, part of the Nile drainage system, Gambella is both an atmospheric and fascinating destination in its own right, and more or less the end of the road insofar as public transport is concerned. The region can be explored as a loop between Addis Ababa and Gambella, which entails heading out to Gambella via Ambo and Nekemte, and returning to Addis Ababa via Jimma and Weliso, but it could as easily be done in reverse. Equally, those with limited time could restrict themselves to a short overnight loop through Ambo and Weliso via Lake Wenchi or travel more extensively in the highlands without actually going as far as Gambella. There is regular public transport connecting the towns on both legs of the loop. During the wet season, the direct road between Nekemte and Gambella on the northern leg may be out of service; when this happens, you can get there via a road connecting Nekemte to Bedele on the southern leg which is tarred in its entirety with the exception of the 105km stretch between Nekemte and Bedele and the 25km section between Matu and Gore. The loop described in the following chapters is all but self-contained, in that there are few decent roads connecting it to other parts of Ethiopia. An exception is the upgraded road between Sodo and Jimma, which would allow travellers to cross between the Rift Valley and western Ethiopia without returning to Addis Ababa. Most of the places described lie at an elevation of 2,000m or greater, and are thus relatively cool and moist. Gambella, which lies below the escarpment, has a hot, humid climate reminiscent of the east African coast and Lake Victoria hinterland. An inviting taster for the western highlands and worthwhile excursion out of Addis Ababa is provided by the road loop that runs west for 125km from the capital to the bustling town of Ambo, then cuts southward for about 65km to the resort town of Weliso, 100km from Addis Ababa on the Jimma road. The focal point of this loop is the spectacular Wenchi Crater Lake, which lies to the east of the road connecting Ambo to Wenchi, and also offers some worthwhile indigenous forest reserves, a trio of attractive waterfalls in the vicinity of Ambo, and a hot-springs resort at Weliso. In a private vehicle, you could complete this loop in one long day, though this wouldn’t leave a great deal of time for sightseeing. A more realistic approach would be to take two or three days, planning on overnight stops at Ambo, Weliso or Menegasha State Forest depending on your budget and interests. There is plenty of public transport along the main roads connecting Addis Ababa to Ambo or to Weliso, the respective springboards for travel on to Nekemte/Gambella or Jimma/Mizan Tefari, but transport between Ambo and Weliso is more limited. This is just but a few places one can indulge in Ethiopia. It has so many other places one can visit whether it’s for educational purposes or just for fun. From the panoramic views of the infamous city of Addis Ababa to interacting with the great diverse people of Ethiopia, their exceptional culture, and tantalizing indigenous foods, vacationing has been so exhilarating. Traversing the archaic, alluring country of Ethiopia is truly a privilege. Offering with a wide range of antiquated, beguiling cities and historical artifacts, with its extraordinary parks and grasslands, Ethiopia is a must visit country. Ethiopia is renowned for being the oldest sovereign country in Africa, with the preponderance of its political past being monarchical. It has been in existence for over 2,000 years, dating back to the first century B.C., when it was under the rule of the Aksumite Empire. During the fourth century, the Egyptians introduced Coptic Christianity. Although Christianity became the official religion of the Aksumite kingdom in the fourth century, the religion had been known in Ethiopia since a much earlier time. The introduction of Christianity as the state religion marked a turning point in Ethiopia history. Christianity does not constitute a purely religious phenomenon in the country but plays an integral role in all aspects of national life. The Church is not only a religious institution but has for many centuries been the repository of the cultural, political and social life of the people. A Muslim leader going by the name Ahmad Gran quelled most parts of Ethiopia in the fifteenth century. After a string of power struggles that occurred around most of the nineteenth century. Sultan Menelik, the second, took over power leading the country through an Italian invasion that occurred in 1895. The Ethiopians crushed the Italians, leading the country to become an independent state. Around 1930, the Emperor Ras Tafari Makonnen put Haile Selassie in power. In 1935 the Italians attempted their second invasion and were successful in capturing Addis Ababa in 1936, leading to the dethroning of Haile Selassie. Before long the Italian East Africa was formed comprising of three countries namely Italian Somaliland, Eritrea, and Ethiopia. Greatly assisted by the British army the Ethiopian resistance defeated the Italians again restoring Haile Selassie to power in 1941. Haile Selassie ruled the country until 1974 when a military coup, planned by General Terefi Benti, resulted in him being ousted. The Ethiopian culture is said to be a multifaceted, multiethnic and multilingual, and these attributes reflect their diversity in their culture and the respect for traditional customs. The Ethiopians style of music is widely divergent ranging from rhythm and sounds established in a variety of ethnic groups, with folk songs dominating the culture. Whereas some Muslims and Christians indulge in religious music, they also have a unique Muslim form of music called manzuma, which is mostly played in the northeastern part of Ethiopia in a region known as Wollo. Ethiopia possesses a wide range of musical instruments. Ethiopians have a traditional form of dressing where the traditional cloth that is worn by a woman is referred to as shemma, which is used in the making of a form of a woman’s dress. Shawls are quite commonplace. The men in the country are accustomed to wearing knee-high t-shirts that have white collars. It has also been noted that their clothes contain heavy quilting and are adorned with jewelry like gold and silver. The women of the Amhara and Tigray are accustomed to wearing ‘Sheruba’ a form of plait worn in their hair. The Ethiopian menu consists of a variety of vegetables and meat-based dishes generally prepared as wat or thick stew. Due to the fact that most Ethiopians are either from the Orthodox Church, Judaism or Islam, the consumption of pork is restricted. Several languages are spoken in Ethiopia. There are about 83 languages which are broadly organised into four prime groups namely the Semitic, the Nilo Saharan, Cushitic and Omotic. The fact that the Ethiopian language consists of 200 dialects, confirms Ethiopia as a multi-ethnic nation. Amharic, a semantic dialect, is also the official language of the nation spoken by twenty-seven million people. The 2nd largest language in the nation is Oromo dialect. There are several Ethiopian festivals but the main ones are Enkutatash, Timkat-Feast, Kullubi, and Maskal where a lot of dancing and singing is observed. Ethiopia climate varies due to its natural setting. But generally, the country is mostly affected by 2 noticeable rainy seasons which are light rainfall between February to March, then followed by heavy rainfall between June to September. You can get to Ethiopia through Addis Ababa International Airport. If you are a visitor to the country you will most likely need a visa in order to enter the country, this can be obtained in advance from the Ethiopian embassy residing in your country of origin. Visas can also be prepared at the airport when you arrive. Requirements differ depending on your country of origin. There is no mandatory required while traveling to Ethiopia that is only when you don’t hail from or lately spent time in a Yellow Fever surrounding, in which case you will have to prove that you have been vaccinated against Yellow Fever. You are recommended to carry vaccines for Hepatitis A and Typhoid and some areas of the country carry a risk of Yellow fever and Malaria. When travelling to these areas it is advised to carry vaccines and prophylactics. Expecting mothers should be aware that there is a low risk of Zika virus in Ethiopia.